No matter where you are on your digital transformation journey, our customer success offerings are designed for every need—now and in the future. Our success offering framework is designed to help your business thrive. It supports the way you do business today—across multi-cloud, hybrid, and on-premises environments. This means you'll see value faster and accelerate your ROI. Ensure a successful data-driven digital transformation with a continuous level of superior support. 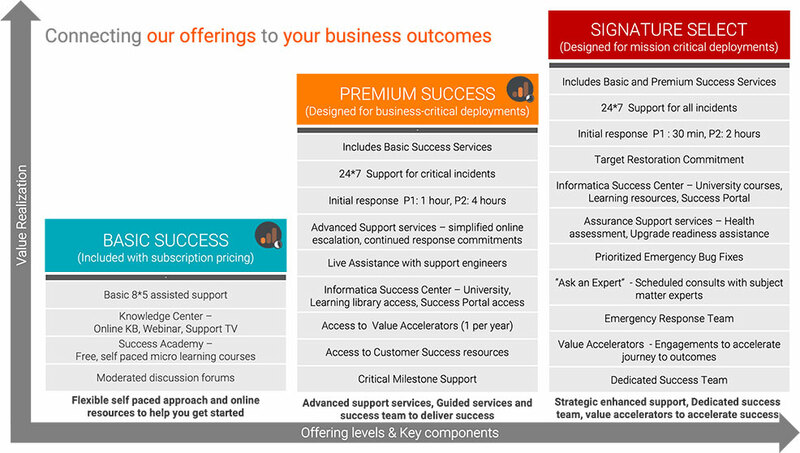 With our scalable customer success framework, you can tailor your services to match your needs. Our Premium and Signature services offer an enhanced experience that includes advanced, proactive support; education courses; and customer success and adoption resources for business-critical deployments. Informatica success offerings are built for the way you do business today—and in the future. See how we’re setting the standard. Maximize your investments with our tailored success offerings. Complex environments demand a new approach to service & support. in a row and ranks #1 in customer experience.